The iDEEP solution provides a complete data analytics & visualisation platform that helps insurance organisations make better informed decisions, by turning data into actionable insights. Organise and visualise KPIs by presenting Management Information in business-focussed dashboards. 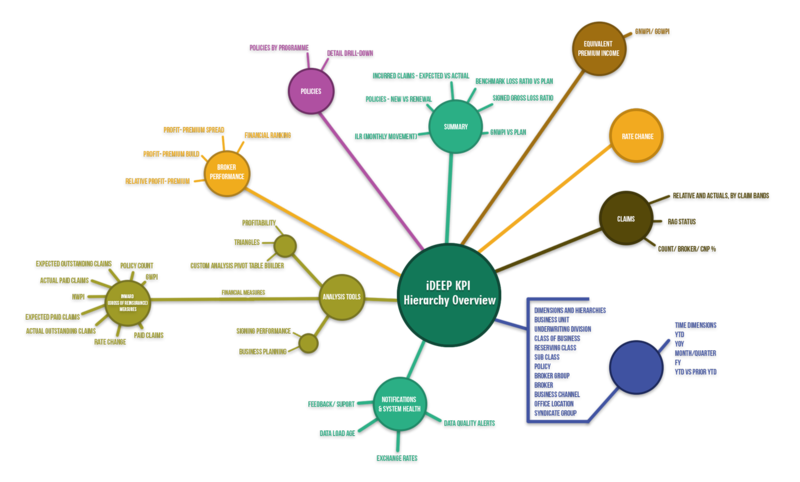 Click on the thumbnail below to view the iDEEP hierarchy overview. We have a framework for Expense Analytics that could be used for building a complete analytics application for analysing the organisation expenses. The expenses could be Travel, Telephone, Mobile Phones, Data Cards or Entertainment etc. The data could come from different sources in different format, but all we do is collate and build a single system to analyse the expenses. We have developed a product that helps in extracting the data from qlikview application through web services. This could be used to intergrate with various other applications, or could be used for picture perfect reporting through other tools. Additionally, it could be used to distribute reports to multiple users. We have a framework for HR Analytics that could be used for building a complete analytics application for analysing people and their related things. The framework helps in analysing the head count, attrition, leavers, utilisation etc. We have the experience working on top of SAP to build BI and we also have templates for various modules that could be implemented as quick as possible to extract the value from qlikview and SAP. We have developed a product that helps in extracting the data from Google Analytics and provides analysis on top of the google analytics data. The exe file developed would be used in qlikview directly to extract data. It supports "date from" and "date to," so that incremental load is possible. We have a framework for Purchase Analytics that could be used for building a complete analytics application for analysing the purchases and its related expenses, effectiveness and efficiencies in an organisation.